Gov. Scott Walker and his administration failed to make so much as a phone call in advance of Kraft-Heinz announcement the company is shuttering the Madison-based Oscar Mayer operation, leaving 1,000 Wisconsin workers out of jobs. Yet after doing nothing, Walker was able late this week to hit send on a fundraising solicitation to try to pay off the estimated $1 million debt his bloated presidential campaign racked up in a mere 71 days. On Wednesday the Heinz-Kraft Corporation announced it would be closing the Madison-based Oscar Mayer operation, ending the Wisconsin operations after over one hundred years and costing Wisconsin 1,000 jobs. The merger of Heinz and Kraft, which owned Oscar Mayer, was announced in March of 2015 and consummated in July. In August 2015, the newly merged corporation announced significant layoffs of front office employees in Madison. Iowa and New York state moved aggressively, and successfully, to retain Heinz-Kraft operations and jobs in their states. Meanwhile in Wisconsin, neither Walker nor his Wisconsin Economic Development Corporation made any contact with the companies. According to a media report posted Friday, Walker is soliciting funds to retire his significant campaign debt. In the email he laments his campaign’s demise and alleges he’s back at work and, despite evidence to the contrary, his policies as governor are a success. Walker’s presidential campaign collapsed spectacularly after a mere 71 days with according to reports an estimated $1 million debt, including as yet unpaid bills for security provided to Walker at Wisconsin taxpayer expense. Amid the finger pointing over who was to blame for his political flame out on the national stage, many noted the bloated staff and exorbitant six-figure salaries paid to his team of operatives. 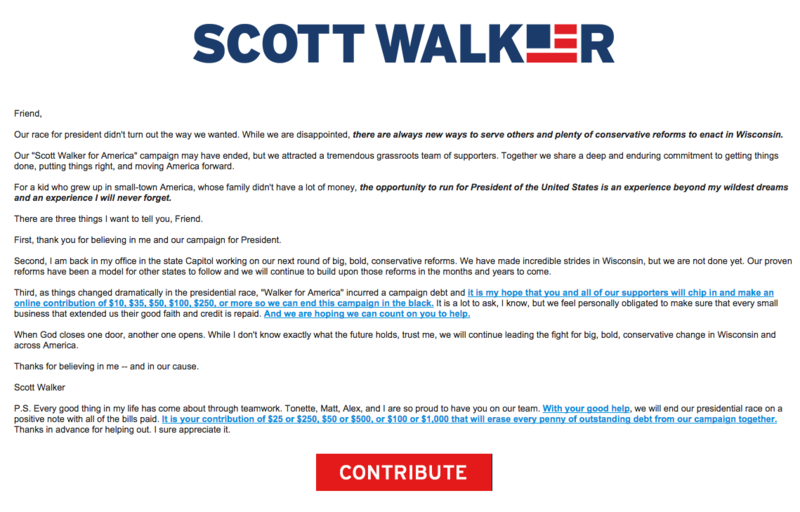 Walker’s got his own family in on the action, putting his two college age sons on the campaign gravy train.